Rangla in Indian language means colourful. 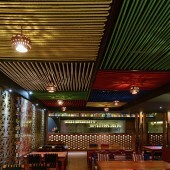 Inspiration for the decor comes directly from the rural areas of Punjab state of India. Rural Indian people love colours and that can be seen on their attire, clothes, accessories they use or even the decorations they do. Here is an attempt to take out essence of colours from the life of Punjab state and infuse in contemporary designs. Located on a roof top in a commercial premises, Rangla Punjab is a North Indian regional cuisine restaurant. One can get the feel of rural Punjab while you dine and enjoy North indian Punjabi Cuisine. 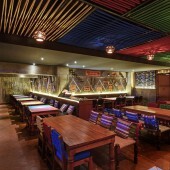 The restaurant is situated on the rooftop of a commercial establishment. It is decided into various sections that have their unique identity. One lands up into the lift lobby and led to the formal indoor section that hosts a bar and open pantry for desserts. This indoor space opens up into terrace that has informal seating. A truck is been used as a feature in open area that has a staircase to go on the upper level. On the other side of lift lobby, there is a private section for about thirty person. Project started in April 2016 and got completed in December 2016. 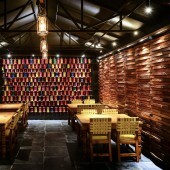 Using sustainable and local materials was the key factor while designing this regional Indian cuisine restaurant. Local stone Kudappah, Brick pavers were used for the flooring, Walls were kept exposed without paint. Features were created using earthen pots, Old rcc galley that one can see in rural areas, and some of the areas were adorn by using Kite thread rolls and old cassettes. A feature of colourful glass bangles in the opening of windows create interesting pattern as the day light passes through. Restaurant is on the roof top of a commercial establishment. It is split into two levels. Total area of the restaurant is 800 square meters. Most of the rural Punjabi cuisine restaurants are situated on the highways called as Dhaba and serve authentic home cooked food. They are built with local available materials and have earthy feel. Rural Punjabi restaurants do not have air conditioners. Natural light and ventilation is one of the key factors. Rangla punjab was designed keeping in mind these principals and designers have tried to adapt rural construction techniques with local materials in the decor. 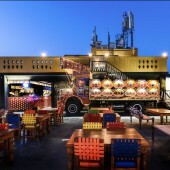 The open terrace of the restaurant has a feature of an actual truck that acts as a main feature and is used to go on the upper level. To lift an actual truck to the terrace level that is about 24 meter above ground level was the biggest challenge. It was achieved by lifting it with the help of a crane, secured properly with cables. Coming up with the sage of happiness, we desire to melt your heart with the very fine quality of Punjabi Specialities prepared from our professionals. We want you to lighten up, settle down and unwind yourself at your own space and we deliver our extraordinary cuisine at your door. Approaching ourselves in Pune, you are just a call away from our delicacies. 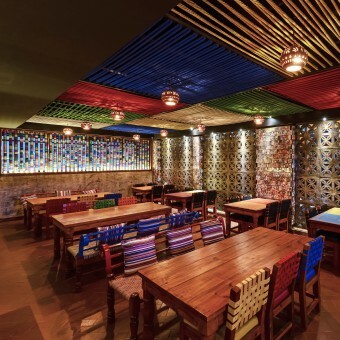 Rangla Punjab Restaurant and Bar by Ketan Jawdekar is a Nominee in Hospitality, Recreation, Travel and Tourism Design Category. Rangla Punjab Restaurant and Bar by Ketan Jawdekar is Winner in Hospitality, Recreation, Travel and Tourism Design Category, 2016 - 2017. · Press Members: Login or Register to request an exclusive interview with Ketan Jawdekar . · Click here to register inorder to view the profile and other works by Ketan Jawdekar . 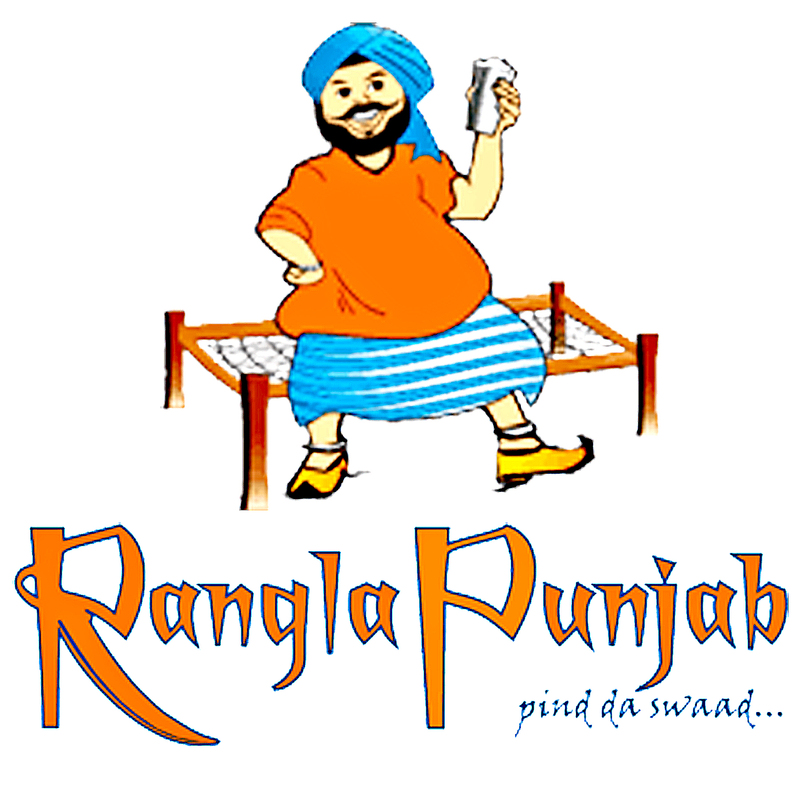 Did you like Rangla Punjab Restaurant and Bar? Help us create a global awareness for good hospitality design worldwide. Show your support for Ketan Jawdekar, the creator of great hospitality design by gifting them a nomination ticket so that we could promote more of their great hospitality designs.